Irene, a Howard County Master Gardener, wrote that note several days before temperatures dipped into the teens here in Central Maryland. Temperature was 13.3°F here at Meadow Glenn at dawn Wednesday, the day I had arranged for Ellen and me to visit Irene and Jim to check out his row cover –and to see her pesebre. Jim said the temperature Wednesday morning at their home was 17°F. He hadn’t yet checked to see how his kale had weathered the cold, but when he pulled back some of the row cover from its PVC support hoops, the kale appeared in perfect condition—ready to cut and take into the kitchen. A row cover is a very light synthetic fabric, often described as “gauze-like,” that gardeners drape over plants. The ultra-thin fabric lets in sunlight, air, and water but, when properly installed, excludes insects and other pests. In cooler weather it can create a warmer micro-climate that helps protect plants from the cold. The fabric comes in various lengths and widths and can be used in a variety of ways. 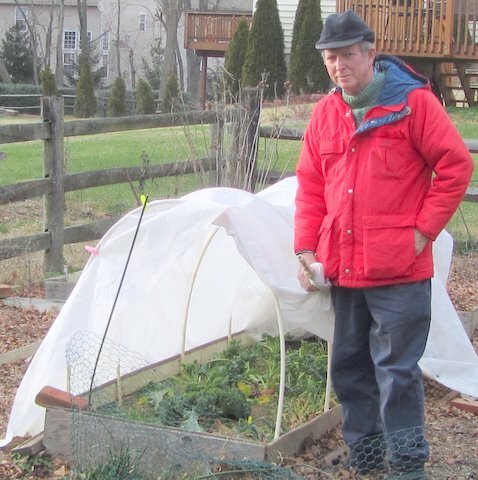 Jim’s row cover forms a protective tent over his raised bed of kale and onions. Here are two sources where you can learn more about row covers. To view the first, a short (<4 min.) 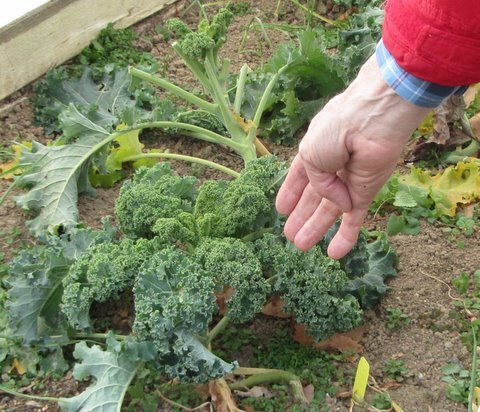 University of Maryland Extension Home & Garden Information Center video, “How to Use a Row Cover in Your Vegetable Garden, CLICK HERE. For the second, a print article with more than 20 explanatory photographs, “Stink Bug Barrier for Tomato & Pepper,” in a Maryland Home & Garden newsletter, CLICK HERE. This posting is about row covers, but I did mention Irene’s pesebre. A pesebre is a traditional Nativity Scene with roots in Spain. Irene continues a family tradition started by her father 60 years ago. To see the 2010 setup of her pesebre, CLICK HERE. ← Got a new tool for Christmas! We usually do a similar row cover, but this year I planted many varieties of Radicchio/Chicory and used 3 beds. My husband created a large hoop house and it has worked great. The crazy thing is that we probably haven't needed it for the Radicchio yet since it hasn't been too cold. But I have some arugula, spinach, and lettuce that are still doing well under there. Thanks, Amber, for your important addition to the discussion. Yes, the extra-warm weather most days has undercut the need for veggie protection. But one night soon…. Yes…that's what we keep telling ourselves with all the hard work my husband put into it! LOL. Love this blog and especially because it is MD based. Been a faithful follower for a while now. i have lettuce and arugula that had been under row cover; switched to thick clear plastic when the temps got colder, and everything looks fine under there. just some tip damage where the plastic made contact (not using any supports on that bed…). i have a feeling that global warming will make it easier to overwinter veggies, but i'm starting to worry that unpredictable and severe freezes later in the spring may get more common too (as in 2007). Yes, Julie, I've noticed that if the lettuce in my mini-greenhouse touches the sides or top and condensation there freezes, so do the leaf edges that are touching. My problem has been mostly with tall lettuce reaching the top, so next season I'll trying a shorter lettuce for the mini-greenhouse in the fall. But the point of our conversation is about how easy it is, with just a little effort, to grow cold-weather crops right through the fall and into winter. I planted lettuce seeds in September of 2010 thinking, “It's Maryland, it won't get cold early.” Was I wrong… Anyway, I couldn't harvest it so I threw a row cover (doubled because it was for insects) and left the poor little seedlings alone. It snowed, and snowed and I never took off the cover, figured the cover and snow acted as insulation. At the beginning of March I took it off and what a surprise, big, full heads of lettuce! In March with no effort on my part. Fantastic. Rancher: Cold-resistant lettuce variety, a little protection from the weather, such as via a row cover, and BINGO! March lettuce! You've figured it out! Your chances of success are better than winning a bingo game!